On any given day, we cross innumerable borders: the threshold between bedroom and living room, between private property and public street, neighborhood boundaries, borough dividers, a personal bubble or two on the subway. These lines define where we are and mark territories where unspoken rules or officially enacted laws hold sway. Some may be disputed, such as where East Williamsburg ends and Bushwick begins; others are drawn through a long history of political decisions. Whether arbitrary, disputed, personal, or universally respected, borders are integral to the idea of distinct places. But what sort of places are the borderlands themselves? As a researcher interested in the intersection of urban form and place, Joseph Heathcott set out to explore how one of New York’s borders shapes the lived experience and physical environment of its surroundings. Through historical research, photography, and deep observation, he traces the city’s only major internal land boundary — the Brooklyn-Queens border — and draws out the social and spatial conditions of this largely invisible urban seam. –J.T. The Brooklyn-Queens border at Irving Avenue and Eldert Street. The border slices through the building and is incidentally marked by the thin grey line in the brick above the right corner of the garage door and in the red paint on the sidewalk noting the sewer main below. In New York City, most boundaries are distinct. They feature inlets and islands and all the drama of big water. We navigate these aqueous boundaries via spans and tunnels, channels and compass headings. Crossing the Brooklyn Bridge, the Verrazano, the Queensborough, or any of the grand kit that connects our city, we see a world of ports and piers, terminals and esplanades. It is a world carved out and defined by the congruence of rivers, estuaries, bays, and ocean, recalling our legacy as a maritime metropolis. But the city is not just a waterworld: three major land boundaries also shape New York — separating The Bronx and Westchester, Queens and Nassau County, and Brooklyn and Queens. And while a fourth boundary uniquely marks Marble Hill as Manhattan’s territory despite the neighborhood’s location on the mainland of The Bronx, the Brooklyn-Queens border proves to be the most enigmatic of the group. This 21-mile borough and county divisor — a meandering line among factories, warehouses, commercial strips, and residential streets — is Gotham’s only major internal land boundary. It separates neighborhoods and people (on paper at least), yet we know little about it. To cross the city’s water boundaries, we channel ourselves into narrow points of access, each invoking a sense of passage. But the BQ land border is open, porous. We can cross at almost any point, moving back and forth with ease. It is unmarked, so we seldom know it is there at all. It is proximate yet remote, marginal yet interstitial, defined yet hidden. And it keeps its secrets well. Over the past three years, I have endeavored to understand this borderland to get a better sense of what lay undigested in the guts of our great city. I spent many hours along the boundary taking photographs, talking with locals, getting to know the spaces of this urban seam. BQ Borderlands, the resulting photographic project first installed at the Queens Museum in November 2013, exposes the social and spatial liminality of this urban landscape, one characterized by its incompleteness and indeterminacy. This boulder, recovered during an archaeological survey in 2000, may or may not be the original Arbitration Rock which once marked the boundary between the towns of Bushwick, Kings County, and Newtown, Queens County, and was subsequently buried in a road expansion. It currently sits on the grounds of the Onderdonk Historic Home in Ridgewood, Queens. The Brooklyn-Queens border is an evolving proposition. Political authorities ranging from divinely anointed kings to duly appointed municipal planners have altered it to accommodate changing political geographies. In 1636, the Dutch West India Company began awarding land grants to Dutch and English immigrants in what would become Queens County. Eleven years later, New Netherland director-general Willem Kieft chartered the small village of Breuckelen. But Dutch control did not last long. With a grand show of force, the British Royal Navy took control of New Netherland in 1664. To govern its colonies more efficiently, the British adopted a county system and established Kings and Queens counties through royal decree in 1683. Originally the border between the counties took form amid farmlands and villages, meandering across fields, marshes, forests, and hedgerows. Surveyors made use of property lines, market roads, Native American paths, and trees to mark the boundary. While Queens achieved its current shape in 1768 with the addition of the Rockaways, disputes over the proper location of county borders continued. The towns of Bushwick (Kings County) and Newtown (Queens) engaged in a century-long dispute over their border, resolved temporarily by a 1769 re-survey that culminated in the designation of a large glacier erratic, “Arbitration Rock,” as the boundary marker. The admission of New York State to the Union in 1788 did not ease the disputes; it merely shifted the locus of juridical authority from crown to local courts. For much of the 19th century, Kings and Queens counties remained primarily agricultural. But the City of Brooklyn grew rapidly through a spate of annexations of surrounding villages in the 1830s and 1840s, while the five original towns of Queens grew slowly into their rural surroundings. The 1873 Beers Atlas shows the speculative grid of Brooklyn reaching its border with Newtown (which now separates the neighborhoods of Bushwick and Ridgewood) while scattered houses, schools, and villages still punctuate the broad expanse of farms and creeks in Queens. The US Geological Survey Map from 1891 records the border as a bright line running diagonally from Newtown Creek at top left to Jamaica Bay at bottom right. An 1898 survey map shows the condition of the borderland, where settlements expand outward from multiple centers amid a clashing patchwork of grids and geographies. These patterns persisted on January 1, 1898, when Brooklyn and Queens became two of the five boroughs of the consolidated City of New York. The formation of the five-borough city had one immediate, though intangible, effect on the BQ border: it rendered it less relevant to people’s daily lives. While Kings and Queens Counties lived on as functional jurisdictions, it was City Hall rather than the county courthouses that now shaped the experience of citizenship and belonging in New York. Arbitration Rock, once critical to the communal peace, became overgrown with weeds and was eventually buried in the expansion of Onderdonk Avenue. The grid and the border continued their dance of refinement through the first three decades of the 20th century. As planners and developers laid out subdivisions, the new rectilinear streets and blocks could not readily accommodate the old borough boundary. The 1922 Hyde Desk Atlas shows the grid of East New York in Brooklyn as it runs up against the boundary of Jamaica, Queens. The border cuts across streets and property lines, a recipe for havoc in the delivery of city services. Which county collected taxes from a property transected by the border? Which fire station responded to a call from a burning house where the living room and dining room lay in different counties? Every year, City Council members from Brooklyn and Queens introduced ordinances to adjust the border to conform to the center lines of newly dedicated streets. But city ordinances to redraw the borders often proved difficult to pass, stalled by partisan bickering, legal disputes, and lengthy land surveys. The city was expanding much more rapidly than the political process could accommodate. Faced with an accumulation of such anomalies, the City finally moved to fix the border in its 1931 Administrative Code. Rather than rely on movable markers such as rocks and trees as surveyors once did, the 1931 code fixes the border firmly to the abstract, extraterritorial survey grid, using coordinates proffered by the US Secretary of War, the US Navy, and other agencies that defined or enforced the boundaries of national sovereignty. The turgid language of the ordinance takes the traveler on a journey of cartographic rectitude marked with piers, street intersections, monuments, and other totems of urban permanence, with coordinates such as “south 55443.500 and east 44730.878, thence northerly along such lane the following courses and distances: North 37° 51′ 25.8″ west, a distance of 272.246 feet; thence north 33° 35′ 42.8″ west, a distance of 463.010 feet.” And so on, for many pages. The borough divisor is thereafter fixed to places that, even then, no longer existed, referencing villages and intersections of the city now obliterated by growth or subsumed beneath a new road. Embedded deep within the Administrative Code, the boundary narrative embodies both the rational language of urban planning and the whisper of ghosts haunting places long gone. Despite the relative cartographic stability of the BQ border since adoption of the new Administrative Code, neighborhoods along the border experienced dramatic social transformations after World War II. In the 1950s and 1960s, Bushwick shifted from an Italian and Jewish enclave to one with a large African-American and Afro-Caribbean population, while the little-known Brooklyn neighborhood of City Line — named for its location at the edge of the former independent city of Brooklyn and once nearly exclusively African-American — experienced an influx of Bangladeshi immigrants after 1965. Amid these changes, the border remains fluid in the conduct of social and civic life, in part due to its marginality. Brooklyn rules outward from its historic center at old city hall, Queens from Kew Gardens, its geographic center. These two realms extend from their centers and collide at the boundary, where lines of authority and responsibility devolve in the murk. Urban services often falter or even fail to reach the far-flung margin, as evidenced by the crumbling condition of street pavement, viaducts, and curb gutters. Coupled with the absence of clear boundary markers, delivery workers and city service providers frequently debate one another over the location of the border. The discernment of streets and addresses presents just one example of this confusion. Between 1964 and 1990, the City deployed different colors for street signs for each borough. While Manhattan, The Bronx, and Staten Island had little need for such differentiation, streets along the BQ border shifted between chromatic schemes: blue letters on white backgrounds for Queens, and white letters on black backgrounds for Brooklyn. The practice proved costly and unwieldy and was scrapped in favor of the uniform white on green signs still in use today. Meanwhile, house numbers proved a stubborn problem, often resolved ad-hoc, with some divided streets following the Brooklyn pattern, others adapting the peculiar hyphenated system of Queens, still others deploying unique addresses keyed to their immediate grids. Some houses display two addresses to ensure accurate mail delivery. In the end, however, the certitude of longitude and latitude, district and designation have had little impact on the experience of the BQ border in everyday life. Lacking the high population densities and grand public investments of central places in each borough, the borderlands feel quiet and serene, sputtering with sporadic activity at the margins. When one stands at the abutment of the Brooklyn Bridge or in Grand Army Plaza, the association with Brooklyn is clear. Likewise, walking along Gantry Plaza in Long Island City or Main Street in Flushing leaves little doubt that one is in Queens. But along the boundary line, the comforts of such place identities melt away for all but the most local of travelers. Even though Brooklyn and Queens are permanently fused — Forgotten New York blogger Kevin Walsh describes them as “conjoined twins” — the tissue that binds them comprises an indistinct and irresolute landscape that remains an obscure cipher in the city’s everyday landscape. Today, the border between Brooklyn and Queens tracks through a series of urban scenes: the waterways of Newtown Creek and Jamaica Bay, the eastern industrial zone, various mixed residential-commercial neighborhoods, the Evergreen Cemeteries, and the bottomlands of Lindenwood and Spring Creek. While 20 of the border’s 21 miles traverse land, the border begins and ends in water. Starting from its northernmost point, the border traces an invisible line down the middle of Newtown Creek, a tributary of the East River designated a federal Superfund site in 2010. Heading east from its intersection with the river, it makes landfall at the intersection of Metropolitan and Onderdonk Avenues. Along the creek, the border braces the heavily industrialized zones of Hunters Point, Queens, and Greenpoint and Williamsburg, Brooklyn. Today, only a few operational docks and piers remain alongside ruined hulks of once-active heavy manufacturing operations. Much of the area is now taken up with light manufacturing and equipment storage facilities. The tips of the 59th Street Bridge and the Citibank Building are among the only clues that you are in New York, rather than any other post-industrial badland. The Brooklyn-Queens border soon passes through the old Bridgewater area, an industrial zone oriented around rail lines and trucking routes, awash in dross spaces created by viaducts and overpasses. While tens of thousands of people cross the border atop the Brooklyn-Queens Expressway every day, few visit the spaces beneath the road’s monumental concrete forms. Heading further east, the border traverses train yards and slices through a series of industrial buildings that span old property lines. The border slices through a series of industrial buildings that span old property lines. As the border leaves behind the zone of bridges, trestles, and flyovers, it enters an area marked by auto repair garages, tire stores, salvage operations, welding and fabrication shops, and restaurant suppliers. Amid the obdurate structures, the landscape features an interconnected thicket of fences, razor wire, scaffolding, steel doors, signage, and temporary architecture. The presence of so many wholesale suppliers results in a constant stream of delivery vehicles entering and leaving heavily guarded parking lots. From the industrial landscape of its eastern stretch, the borderland changes dramatically along Cypress Avenue. Here it threads through streets jumbled with residences, schools, churches, mosques, small businesses, garages and storage facilities. This mixed zone is interrupted only by the expansive greensward of parks and cemeteries, where the border deviates from its southeasterly course to head northeast, traversing the Cemetery of the Evergreens, Highland Park, the Ridgewood Reservoir, Cypress Hills Cemetery, and Forest Park, before turning sharply south and reentering the neighborhoods along Eldert Lane south of Jamaica Avenue. The border traverses the Cemetery of the Evergreens, Highland Park, the Ridgewood Reservoir, Cypress Hills Cemetery, and Forest Park before turning sharply south and reentering the neighborhoods along Eldert Lane south of Jamaica Avenue. Residents in the areas on either side of the cemeteries constantly cross back and forth over the boundary line as part of their everyday routines, threading through multiple neighborhoods in the process. Hanging out at the corner of 95th and Forbell, for example, residents move between Brooklyn’s Cypress Hills and Queens’ Woodhaven and Ozone Park. When asked, they offer a range of opinions on where the borough and neighborhood boundaries lie. 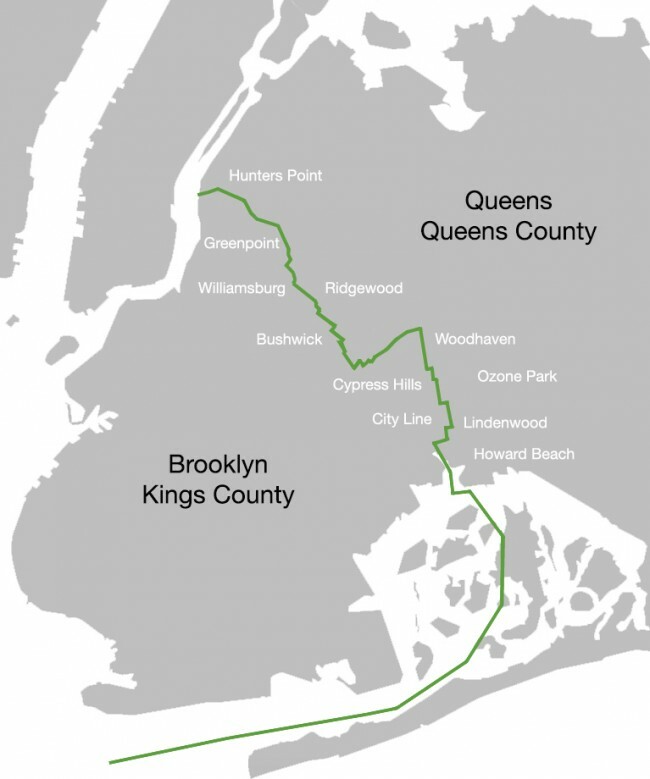 The final stretch of the Brooklyn-Queens border, before it plunges into Jamaica Bay, traverses the bottomlands of Lindenwood and Howard Beach. Lindenwood sits largely below sea level in the bay-fed Spring Creek Basin. Residents have learned to cope with the periodic floods that scour the streets and landscape. Many properties sit behind fences and gates, giving the neighborhood an air of foreboding. Shops along Wyckoff Avenue just southeast of the Myrtle Avenue L train stop — the photograph was taken from the Queens side of the street. Eldert Lane looking toward Jamaica Avenue — here the border separates Cypress Hills, Brooklyn, on the left from Woodhaven, Queens. Given my interest in the everyday life of cities and the ways in which human creativity shapes urban form and meaning over time, I aimed to root out some sense of place amid the jumbled conditions of the BQ borderland. Making photographs was a way to contemplate the interstitial corridors, fragile moments, and recombinant environs and to capture a trace of meaning. The photographs play with the boundary’s key urban condition: an ordinary landscape, winding through the folds and creases of the city, unfinished but always in the making. When I began this project, I presumed that individual photographs shot at ground level might capture some sense of the border, even if in splinters and fragments. Perhaps a saturation of thousands of images might approach a divination of the whole. But something else emerged from the process: there is ultimately no “whole” to know; the border emerges as a kind of uncanny space resistant to capture. What I produced through the photographs is not the border but a border imaginary, a set of moments and conditions made meaningful by querying them. Ultimately, then, the BQ border only becomes a place when we look at it. It is an invisible thread that weaves through multiple places, but the border itself is not a place until we pluck its strings. And yet, by following the BQ border like a seam through the urban fabric, we encounter a city often unseen by most New Yorkers, a boundary unfolding through a radically indistinct urban landscape. For all its legal certainty, and however we conjure it through narrative, the experience of the BQ border will always be fragmentary and incomplete. Photographs by Joseph Heathcott. All rights reserved. Joseph Heathcott is an Associate Professor of Urban Studies at The New School and current President of the Society for American City and Regional Planning History. He held the U.S. Fulbright Distinguished Chair for the United Kingdom, and has taught at Chelsea College of Art and Design, the London School of Economics, the Catholic University of Portugal, and the University of Vienna. Excellent and lyrical analysis of the nebulous world of inland territorially! Thank you. The boundary was once clearly marked by street sign color, but the Rhodes scholars in government decided to change that. It was an extremely handy guide in knowing what borough you were in. My understanding was that the feds stepped in and demanded standard highway signage, green on white. I’m still perplexed why the city didn’t seek a waiver. Prudence–thanks for the link to your article, I just read it and it is a nice detailed study. Kevin–I had a paragraph in the original version about the street sign colors but reduced it for space reasons. I didn’t know that the Fed was involved, that is an interesting twist. I wonder what their stake would be in local streets and signage? Thanks for writing this article about a subject that has long interested me. However, I think one correction is in order. The resolution of the border in the Bushwick/Ridgewood area occurred in 1925 as per the action of the NYS legislature. By that time, the street grid had been sufficiently developed to enable the Cypress to Menehan to St. Nicholas to Gates to Wyckoff to Eldert to Irving border to be established without that much difficulty. The situation was probably somewhat more complicated for the area south of the cemeteries thus causing the arcane actions that you noted.. When the new borders were set, the one=block Eldert St. section was included in the grounds of Webater Park, an old ballfield that extended from Halsey to Covert. While the park closed shortly thereafter and was converted into a mostly industrial area, Eldert St. was never fully opened between Wyckoff and Irving. This made it relatively easy to demap the unopened portion in the mid-1970’s in order to enable the border crossing factory depicted in your first picture to be constructed. I agree with Kevin that it was a beaurocratic mandate from the Federal government rather than operational inconveience that caused the City to abandon the borough specific street signs. This was a loss since it was always fun to ride down Cypress Ave. and see where the borough lines shifted. If you would like to pursue this topic with me further, please contact me at my jdereszewski@gmail e-mail address. I just need to correct one item in my previous comment. The old baseball field was Wallace – not Webster – park. Sorry I didn’t respond earlier, as I am just now seeing your incredibly helpful and interesting post. I will certainly incorporate your observations into any subsequent draft of this piece. One question I have for you, since you obviously have a detailed knowledge of the border: do you have any idea why all of the houses along Cypress Ave are turned 90 degrees away from the street? It is one of the longest stretches of street I have seen anywhere in the city where the street is faced by the sides of houses, rather than the fronts of houses. It is very odd. I know that there was a small diesel-powered train that went up and down the street in the early 20th century, but I am not sure that is an explanation for the peculiar orientation of the houses. Have you considered writing a book on the subject, which is fascinating to me? I have relatives who continue to argue over where they lived: Bushwick vs. Ridgewood, Brooklyn vs. Queens. If you’re interested in discussing this, please contact me via email. Retired sanitation worker Nelson Molina has collected and curated thousands of things New Yorkers threw away. A photo essay by Lana Barkin.